End users expect fast loading pages across multiple devices that are always available. Improve the end user experience when you have complete visibility and can resolve issues faster. Cloud, mobile, and IoT add complexity to an already complex delivery chain. With multiple points of failure, including some you may not control, you need complete visibility into end-user experience. The only monitoring that matters is from the end-user’s perspective—including all first and third-party elements. It doesn’t matter if it works inside your cloud provider or data center alone. What matters is meeting user expectations. 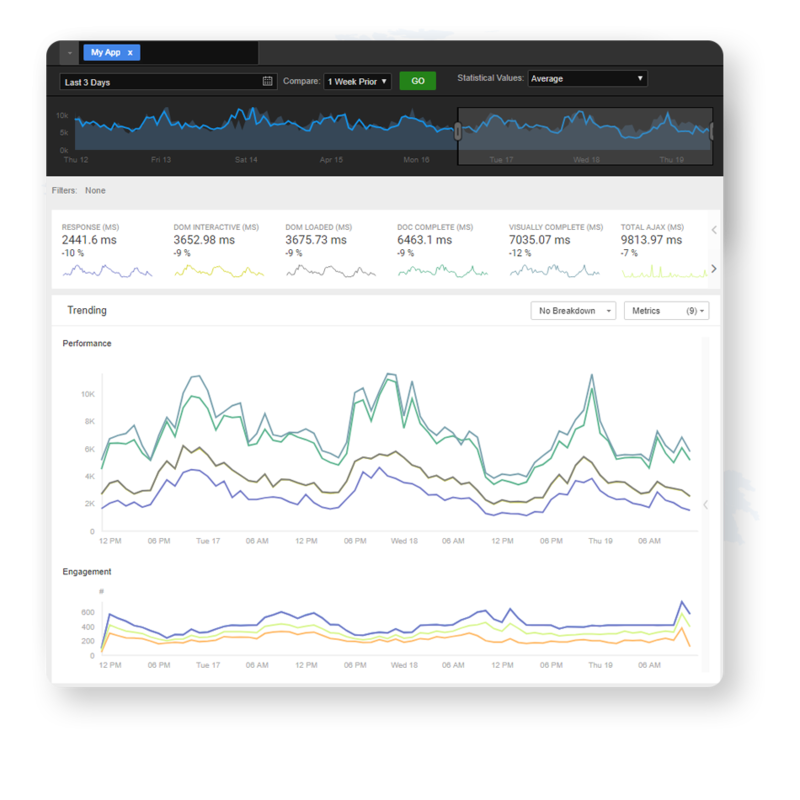 Collect synthetic and real user measurements on a single platform. Test all components impacting the end user experience with 20 pre-packaged monitor types or deploy a custom monitor on Enterprise Nodes. Run tests from backbone, broadband, cloud, last mile, and wireless providers, or from your own Enterprise Node to see performance from the first, middle, and last mile. Receive contextual alerts when performance deviates from expected levels. See performance on algorithm-powered dashboards that you where problems are originating. View historical and unaggregated data to get to the details you need. Not all changes to an application result in improved response times or reliability. Don’t waste time making a change that won’t improve the end user experience. Model and validate performance when conducting a/b tests of new releases, comparing CDN vendors, and expanding into emerging markets. Baseline and benchmark performance of your applications and competitors over time. View request level details for pages visited by real users. Track first and third-party content with custom categories. prevent up to 99% of end-user experience issues. 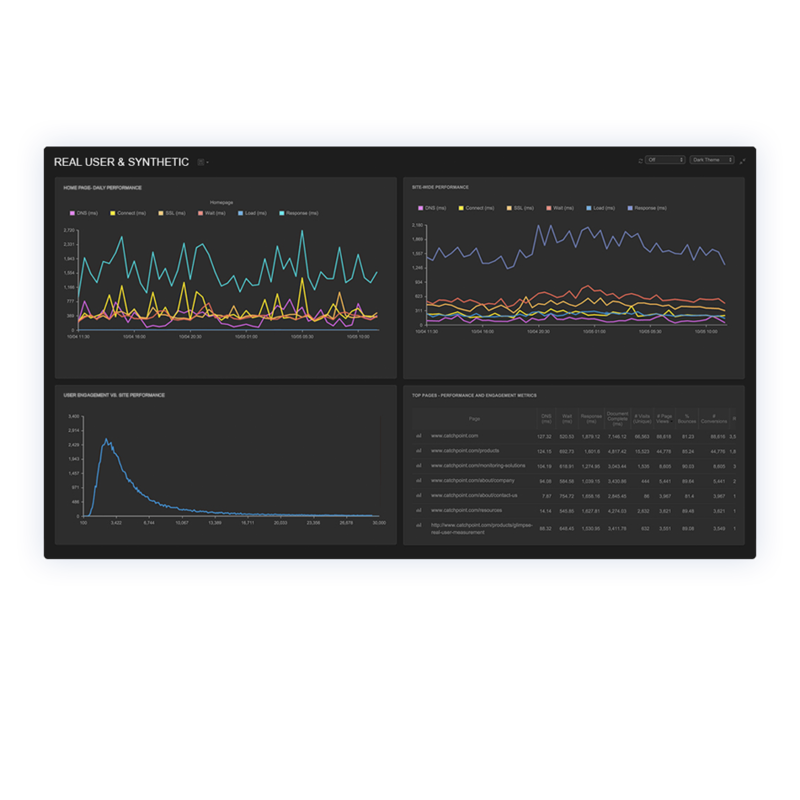 Comprehensively detect issues across third-party services, CDNs, DNS, APIs, Cloud, networks, systems, and more. Utilize our purpose-built data and analytics engine, designed for performance. 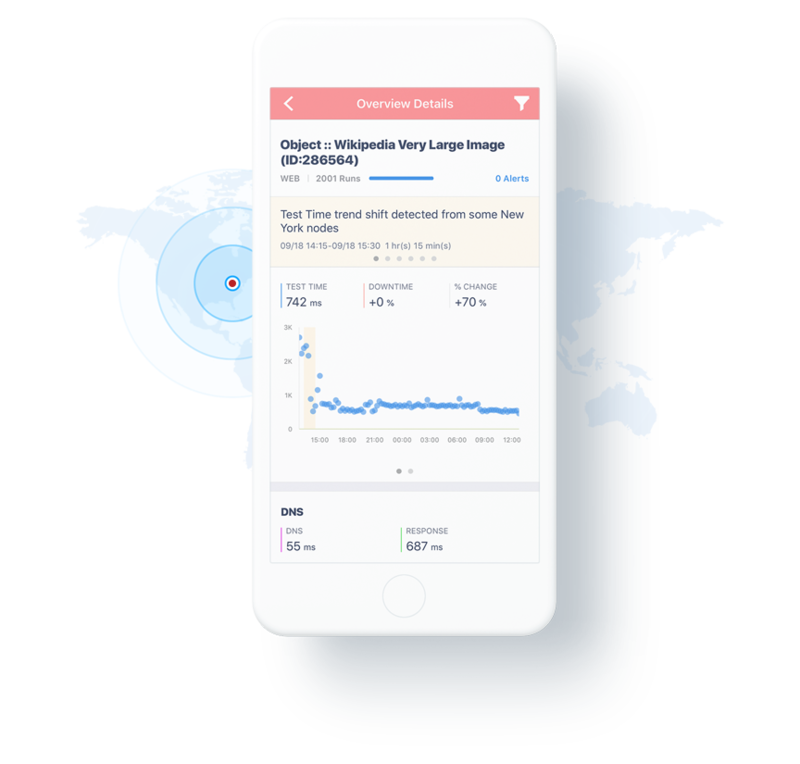 Get intelligent alerts, triggers, and insights delivered via intuitive dashboards and workflows. "The ability to replicate and measure the actual end user experience regardless of geography allows AppNexus to detect performance issues – whether they’re rooted in the application, a third party, or at the network level – before users are impacted." "When considering whether to deploy new servers, make changes to their cloud providers, or evaluate a new CDN, Priceline is able to use the request override feature within Catchpoint to determine what effect the proposed change will have on their end user experience." Why end user experience monitoring? Today, end users’ expectations are higher than ever. Every customer touch-point matters. Every detail is important, including performance, availability, and reliability. Increased user expectations have led companies to invest in tools that measure how customers interact with content. Performance metrics on user interaction is necessary for understanding end-user experience. Continuous delivery and deployment to meet customer demands for features and functionality can lead to unexpected performance problems. Continuous monitoring in pre-production and production environments will lead to fewer outages and performance degradation thus solidifying customer loyalty and advocacy. Determining the current state of performance will allow you to optimize services and configure alerts. The first step toward improvement is to create a performance baseline, then observe trends and patterns. Without detailed current or historical performance metrics and data, you can't create an optimization strategy.